This third of three excellent Shout! Factory holiday releases from 2003 offers another spectacular display of vocal prowess by a multi-generational artist roster. 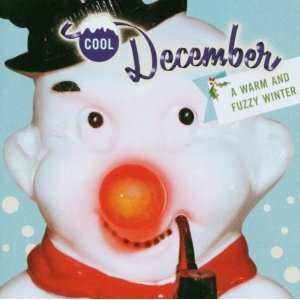 Note the title, however: Cool December: A Warm and Fuzzy Winter is not a collection of Christmas songs, but rather tunes inspired by the feel and feelings of bleak midwinter. The predominant theme is one of snuggling up and staying warm by the fire, a lover's arms providing a safe haven from the big freeze outside. Moreover, the voices enlisted to advance the concept are, for the most part, female. The few males on hand do fine: Bing Crosby sets the tone with the album opening advisory, "Looks Like a Cold, Cold Winter" (his avuncular tone and gentle swing making it clear that the subtext is, "so stay in here with me"); Dean Martin is at his most seductive in dreamily crooning a beautiful, string-rich swooner, "Winter Romance"; John Pizzarelli thoughtfully wonders, in a bluesy, orchestrated arrangement, "What Are You Doing New Year's Eve"; and Frankie Carle demonstrates with a frisky, frolicking piano solo why he was known as the "Wizard of the Keyboard" on a big band treatment of "Little Jack Frost Get Lost," on which Marjorie Hughes provides a sassy vocal. Billie Holiday, ‘I’ve Got My Love To Keep Me Warm.’ Cozy Cole, drums; Edgar Sampson, clarinet/alto sax; Ben Webster, tenor sax; Jonah Jones, trumpet; Teddy Wilson, piano; Allan Reuss, guitar; John Kirby, bass. (1937) From Cool December: A Warm and Fuzzy Winter. Otherwise, Cool December belongs to the ladies. No song here captures the disc's prevailing mood better than Doris Day's cooing, comforting version of "Let It Snow! Let It Snow! Let It Snow!" with its soothing, mellow strings. Pearl Bailey is not so easily seduced into cuddling up with her beau in a 1949 version of "Baby, It's Cold Outside," but as her silver-tongued companion, Hot Lips Page amiably cajoles and suggests and finally woos her into his love nest at song's end, in a mellow jazz treatment of one of Frank Loesser's oft-recorded seasonal standards (seven versions of it were released in 1949 alone, with four of those making it into the upper reaches of the Billboard Singles chart). Classic pop singing gets no better than that of honey-voiced Jo Stafford, one of the great singers of the 20th Century, and she's here with a catchy swingfest from one of her Christmas albums, "Winter Weather," on which her genial demeanor and gracefully rhythmic phrasing, abetted by the bopping orchestra behind her, makes an effective case in favor of warm bodies pressed against each other as the preferred protection against the season’s chill. Stacey Kent, ‘Violets For Your Furs,’ from her 2009 album Dreamsville, and featured on Cool December: A Warm and Fuzzy Winter.